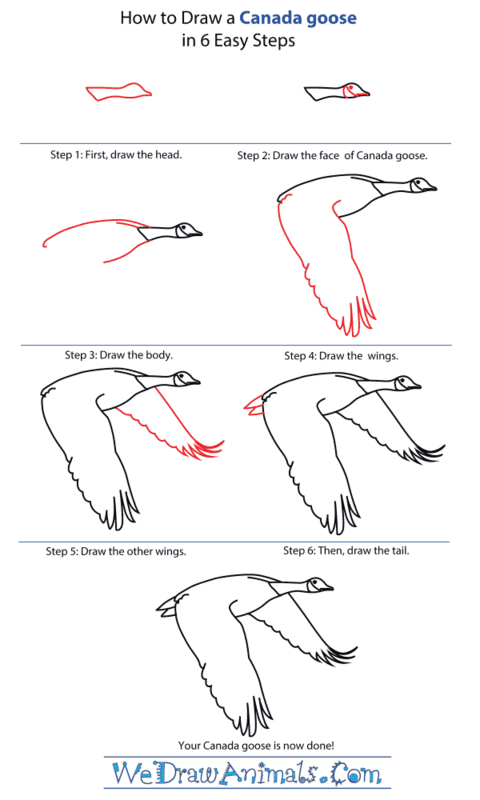 In this quick tutorial you'll learn how to draw a Canada Goose in 6 easy steps - great for kids and novice artists. 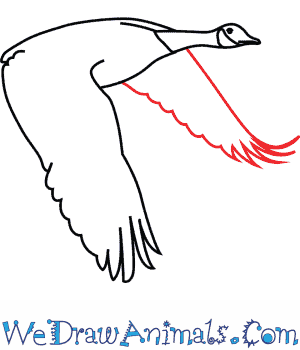 At the bottom you can read some interesting facts about the Canada Goose. 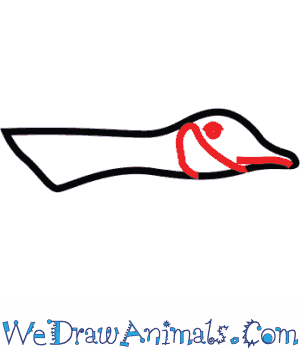 Step 1: First, draw the head as shown above. Use a bump for the head and have it end at a slightly rounded point for the beak. Use a line to separate the neck from where the rest of the body will be. Step 2: Use a single line to create the mouth, two more to separate the head from the neck, and a dot should be used to create the eye. 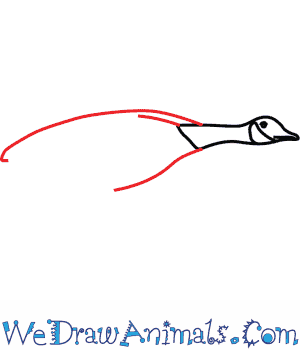 Step 3: Draw the body using a few curved lines, leaving a gap for the wings later. 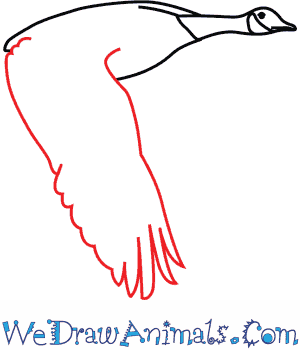 Step 4: The wing should be as large as the body, being made with two lines that start on the inside of the body. At the end, there should be bumps and indents made so as to create the feathers. 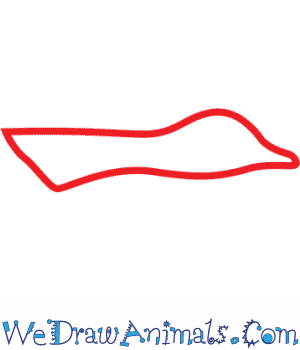 Step 5: Draw the other wing with more bumps and indents on the side, but use a smooth curved line on the top half. It should look just a little bit smaller than the other wing. Step 6: Draw two triangles coming off of the left side of the body to create the tail. They should touch, but there should be a gap between the points. Your Canada Goose is now done! 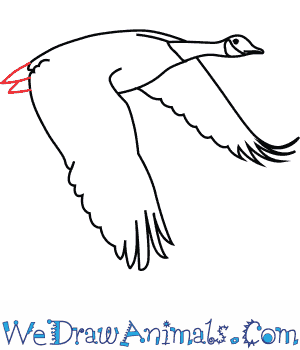 The Canada Goose has a black head and neck. It also has white patches on its face and a body that is brownish-gray in color. The Canada Goose is native to North America, but you can also find them in Britain and New Zealand, as well as in other locations that have similar weather to North America. You can find loads of them in the Great Lakes area! In the 1950s, it was believed that the Giant Canada Goose was extinct until 1962, when a flock was found in Minnesota. 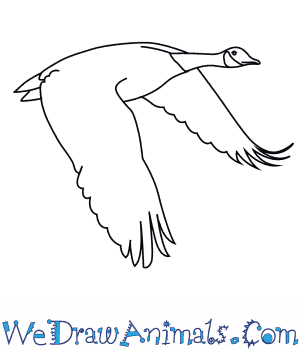 The number of Canada Geese has increased in recent years. This is because they have less natural predators and more artificial bodies of water in which to live, like golf courses, parks, and beaches. Canada Geese are mainly herbivores, which means they love to eat plants and grains. Though, sometimes they’ll also eat small bugs or fish. Sometimes, they’ll even pick leftover food out of people’s trash bins! The lifespan for Canada Geese is a long one. They live, on average, between 10 and 24 years. Some of Canada Geese’s natural predators include bears, coyotes, foxes, raccoons and crows. Back in the year 2000, it was believed that between 4 and 5 million Canada Geese lived in North America. In Kansas, the geese population grew from 1,600 to 18,000 birds in only 21 years!